Please Note: A full video tutorial on how to do this will be presented on an upcoming episode of Category5 Technology TV. So, what can this bad-boy do, beyond reasonably decent photography and better-than-entry-level 1080p recorded video? Why, HD clean video over HDMI … with a little know-how. Tonight is our first test: to see if the D5100 could be used as an A camera for Category5 Technology TV while we continue to save up for the 4K option (which we just can’t afford yet). Our AC adapter (a clever “battery pack” power unit) arrived today, and so I’m finally able to test if 1 hour of live video is possible… since the batteries it relies on typically only last about 30 minutes when rolling video. 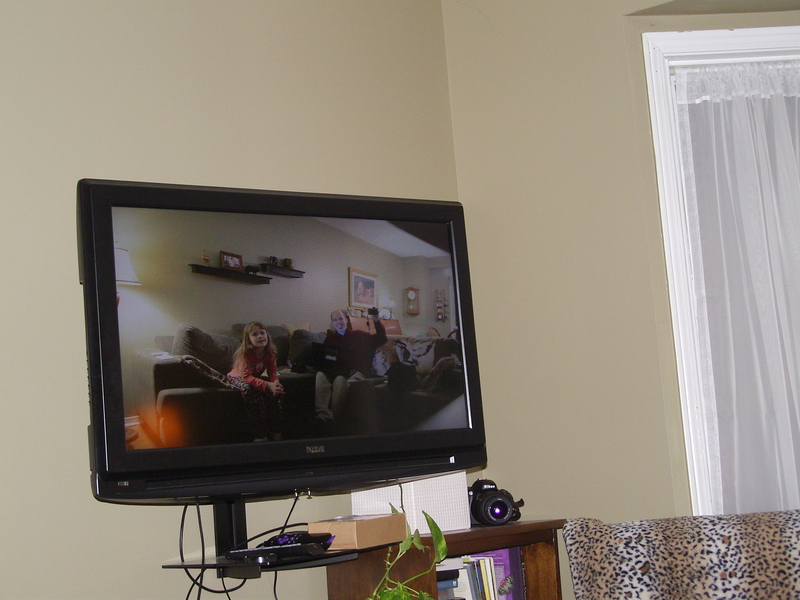 40 minutes in, and the hacked camera continues to feed brilliant, crystal clear video to my TV. I’m running it at 720p since that’s the resolution of the show, but the live view will do up to 1080i. The color saturation is incredible. Really, really impressive. My maroon shirt look exactly the same on screen as it does when I look at my arm. So far, it’s looking good. I think we’re going to hit that 1 hour mark. If we do, this is revolutionary. A very affordable stop-gap solution… maybe not even that, since it really does look great. Consumer 1080p cameras have nothing on the D5100 as far as video goes. The biggest failing of the DSLR form factor is its auto-focus. Fine for shooting nature shots, but useless for video. So if all goes well with this test, the next step will be to find a reasonably priced follow focus rig. My goal is to be able to secure all we need to put together a decent camera rig and have spent only about $1,000… the cost of an entry level prosumer camcorder. This way, we’ll have the follow focus rig already on hand, and when the money is in the bank to buy a 4K DSLR, we will only have to sub out the D5100, which will make a great stills camera at that point, or could be used for B-Roll. Update: an hour has passed (now about 1 hour 15 minutes) and still running flawlessly. This means we will begin testing the camera on-air, and then will offer a full tutorial on how to hack and use a Nikon D5100 as a live camera source on Telestream Wirecast. That’s the DSLR sitting on the shelf next to the TV.